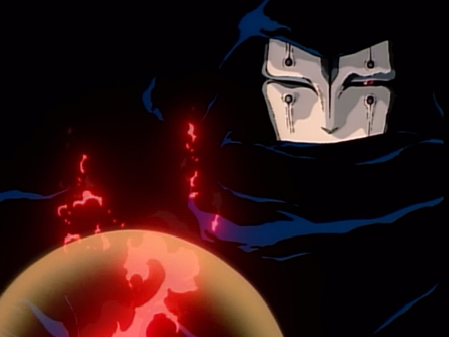 Vampires are certainly no strangers to anime, regardless of what genre or time period they find themselves. From Osamu Tezuka’s Don Dracula to Hideyuki Kikuchi’s Vampire Hunter D all the way up to Kouta Hirano’s Hellsing, you’d be pretty hard-pressed to find a genre that doesn’t have at least one vampire series. 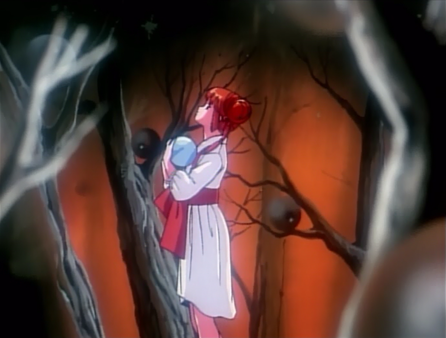 I took a dive into the 1988 4-part OVA Vampire Princess Miyu– hoping for a short yet intriguing watching experience. 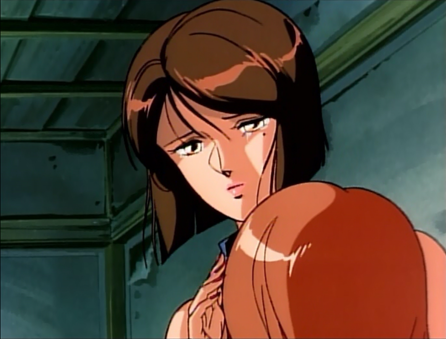 Miyu was directed by Toshiki Hirano, whose other works include Devilman Lady and the Magic Knight Rayearth OVAs. Additionally, the series’ music was composed by Kenji Kawai, composer for other anime including Ghost in the Shell, Higurashi no Naku Koro ni, and Patlabor. 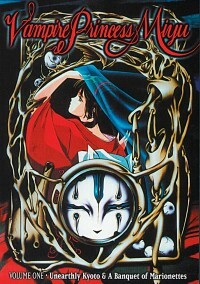 Vampire Princess Miyu also eventually received both a full-length TV series and a manga adaptation in the nineties. Shinma, demons said to have descended from the gods themselves, are currently preying upon innocent humans in modern-day Japan. Himiko Se, a spiritualist, is hired to investigate one of these supernatural cases when she meets the mysterious girl Miyu. Alluring, coy, and childish, Miyu is a vampire and Guardian whose job is to vanquish the Shinma and send them back to the darkness, with the help of her masked and ever silent servant Larva. However, Himiko is extremely wary of Miyu, who has demonstrated immunity to typical vampire weaknesses like holy water and sunlight; additionally, Miyu is more than willing to drink the blood of despairing humans and allow them to partake of her vampirism to live in bliss. The stories in each episode are independent; with no overarching plot, just re-occurring characters. The first two episodes mainly deal with the Shinma attacks and the victims, as well as Himiko’s investigations and Miyu’s interventions. The third episode squeezes in some backstory for Larva, revealing his Shinma origins and how he came to be Miyu’s servant, while one of Larva’s old companions attempts to rescue him from his servitude. The penultimate episode finally reveals Miyu back story, showing her slow transformation from a hopeful teenage girl into a vampire, rejection of becoming a Guardian, and being forced into a life of fighting Shinma for the sake of her parents’ souls, vaguely reminding me of lead character Ai Enma from Hell Girl. The strengths of the individual episodes vary; I found the first episode to be the weakest, while the final episode was probably the best. The “victim-of-the-day” type of plotting for the first two episodes may be enough to gauge my interest for a short time, but they lack anything substantial as a result. The episode elaborating on Larva’s backstory was a bit messily done, trying to combine his backstory with two sub-plots, but it was definitely an entertaining episode. Finally, the last episode was really straightforward, and pulled no punches to explain Miyu’s backstory. In such a short period of time, the show is able to build up Miyu’s personality and backstory fairly well, showcasing a typical “mysterious beauty” type of vampire while still playing up Miyu’s more childish tendencies, such as her jealousy over a male classmate in episode two. The addition of Larva’s focus episode is also a nice bonus, as his history could have easily been explained away in a throw-away line or two. On the other hand, the lack of characterization for Himiko, who is effectively the show’s deuteragonist, was rather disappointing. For a secondary character who is so heavily involved with the better part of the show’s plot, she’s awfully dull, to such an extent that she could easily be replaced by a generic character-of-the-day. Effectively, we have two fairly fleshed-out main characters, and one who barely has any more personality than a piece of cardboard. Pros: When the story gets, it can be fairly engaging. Animation reaches a fine level of detail accumulating in the close up shots. Has a catchy closing theme. Larva’s real face is rather pretty when you finally get to see it. Cons: Lack of continuous story and varying episode strength greatly lessens Miyu’s overall impact. Not enough characterization for Himiko. I never found it actually scary. There are some instances where the voice acting ends up rather flat, which hampers certain serious scenes, but thankfully, it’s mainly limited to the minor characters. Vampire Princess Miyu is licensed in the U.S. by AnimEigo, part of the handful of anime they still have in circulation floating above their sea of samurai films. While Vampire Princess Miyu has a decent premise with a distinctive protagonist, its insistence on stand-alone stories and overall short length makes it rather forgettable. It’s certainly not a terrible series, but it doesn’t quite have enough substance to be memorable to me, with either its story or characters.